I haven't played along at CAS-ual Fridays in so long, did it not seem that the summer just vanished? So this week seemed like a good week to jump back it. I used the very first embossing folder I ever bought and knew it would be perfect for this week's challenge. I stamped my sentiment on white and heat embossed with Tangerine Zing powder. Perfect sentiment for that EF!! Beautiful CAS card, Tracey! I love the dry embossed background with the bold sentiment! Great use of the CAS-ual Fridays Stamps! Oh this is a perfect clean and simple card and a GREAT take on our challenge! Wow! I love all of the embossing! So cool! 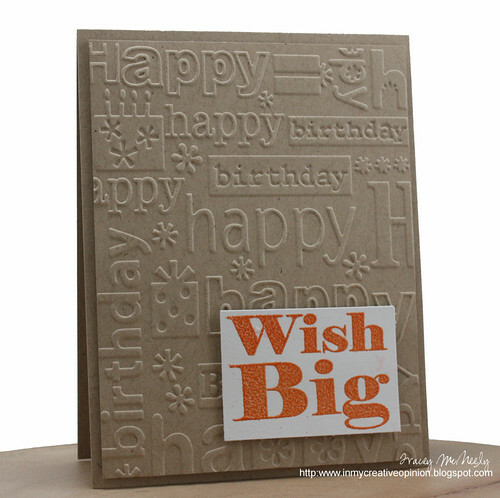 The embossing is so crisp and absolutely perfect for this challenge! This is fabulous! So glad you played along with us over at CAS-ual Fridays! love the embossed background.. awesome birthday card. Man, does that embossing look sharp on the kraft! So very CAS, yet really interesting too with your panel and sentiment on top. Nice stamp : ) So happy to see you at CAS-ual Fridays, Tracey!! Thanks for being such a faithful visitor to my blog over the summer--it was always such a joy to see your smiling face in the comments section!! It was such a crazy busy summer--I never had the time I wanted to for getting out to visit folks in blog land. But with the kids back in school now, I'm hoping I'll have a little more time to myself these days!!! Perfect for this challenge! Super cute too! Thank you for joining us at CAS-ual Fridays! What a fun birthday card, Tracey, love that embossing folder! Have a lovely Thursday evening. haha, love this week's challenge from CASual Fridays! Way to rock it girl, love the multiple layers and embossing! looks great with the embossed text! love the embossed background and pop of orange. super card, Tracey! thanks for joining us at CAS-ual Fridays Challenge! This is absolutely perfect. I have that embossing folder, and forgot all about it. It was one of my first and favorite for a long time. What a super CAS card, perfect for any gender. Perfect CAS birthday card! Love the kraft and bold orange sentiment! Just so fun! You and kraft go so well together, really what a pair! I love this card and loved it so much that I had to pick up the birthday embossing folder too. Fabulous card Tracey! It really is ridiculous how fast the summer has passed by. It's gonna be Christmas nay minute now... I think this was the first embossing folder I ever bought too and you're right - it's perfect for his challenge! Love how you paired it with the simple sentiment! awesome! kraft and orange...a wonderful pair!